For the past three years, I’ve made my way to Las Vegas for the National Association of Broadcasters (NAB) show. The NAB show is a giant trade show and conference that aims to address and educate the varying aspects of the video, film, and digital industries. The show had approximately 1,800 exhibit booths and roughly 100,000 people in attendance. Every year, the attendees and speakers come together to observe and discuss all things involving motion pictures and emerging technologies. While attending NAB, I always find myself spending a large portion of my time at the Maxon booth. 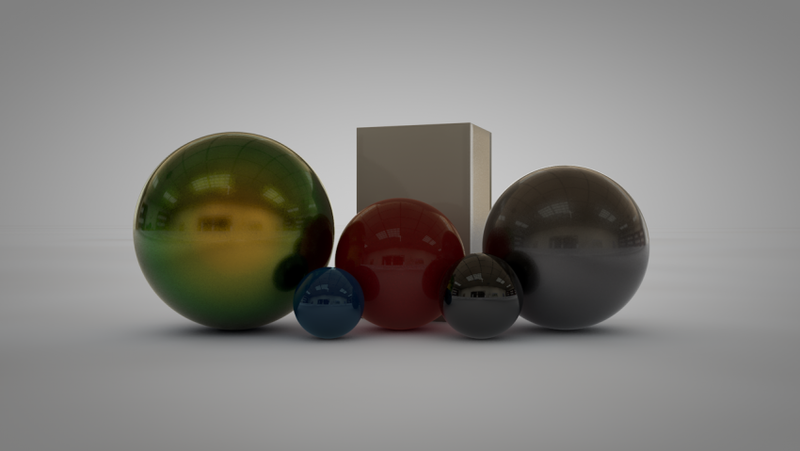 Maxon is a software company that developed the 3D package I use called Cinema 4D, or C4D. Every year, Maxon invites all C4D users to attend their booth to talk about the breakdown of various projects, workflow tips, often missed tools, production pipelines, and animation and modeling tips. This year was no different, and they had a lot of great things to show. Nick Campbell (@nickvegas) is the founder of Greyscalegorilla. Greyscalegorilla is a site that creates tutorials and tools for C4D users. And every year I attend NAB, I make sure I attend his presentation. This year, Nick Campbell spoke about creating custom HDRI (high-dynamic-range imaging) maps using a Theta 360-degree camera. A HDRI map benefits the 3D workflow by helping light the scene and causing environmental reflections for your models. This technique can be seen below. The guys at Greyscalegorilla also developed a technique that quickly uses the Theta 360 camera to export 360-degree HDRI maps from wherever you want. These maps can then be imported into C4D for use. To master this technique, I recommend taking a look at this in depth tutorial created by Greyscalegorilla. Chris from Greyscalegorrila is like a living encyclopedia when it comes to C4D. This guy knows, what seems like, everything about c4d so when he puts on a presentation I make sure I’m there. It’s always great to walk away learning something new, and this year was no different. Unlike his past presentations, this year he didn’t have specific pieces in mind. Instead, he focused his entire presentation on the topic of UV texturing. Specifically, how to use a vertex map to texture a specific spot of your model in a very organic way by painting on your textures onto your model using a weighted texture map that can help blend textures across you model. If you would like to learn more, I suggest watching the rewind video here. Not only do I think Donnie Bauer (@Donnie_Bauer) is a rad guy, but I also think his team at Optimus Designs is super talented as well. And at the NAB show, they showed off their talent. In Donnie’s presentation, he broke down two projects for everyone in the crowd to watch and learn from. The first project he talked through was for Blue Cross Blue Shield. He discussed how he and his team combined a 3D workflow as well as 2D traditional animation workflow together to create an awesome piece. Most of all, the main animation was created inside of C4D while all the accented animations were done with traditional 2d animation. The second project he discussed was just as impressive as the first. This project was a title sequence for the Form-Festival where Donnie and his team used a simple C4D deformer. A deformer is a C4D tool that manipulates a model depending on what it is, and is later animated. So the team used this simple tool to build and drive the entire animation and design, then finished it off with some awesome sound design, and excellent editing to make a super clean project. The full piece can be seen below. Jeremy Cox (@jereremy) has been at NAB every year I’ve attended. And every year I’ve gone, I’ve been able to witness him and his team kill it. This year, Jeremy had two presentations over the course of a few days. Of those presentations, the one I really enjoyed was one where he covered what he and his team did for the SXSW 2016 Video Game Awards. When Jeremy went over this project, he showed the crowd how he and his team developed the title sequence for the SXSW gaming awards. He discussed everything from how they went about animating the hero character, which initially was a challenge because of its odd shape, to how they used textured and lit the whole scene with a clever and simple Xpresso setup. He then went on to explain how the Xpresso setup allowed them to change the scene setups very quickly. This meant that when they changed the camera angle they could simply plug in some new variables into the Xpresso setup and were back to animating the piece. Watch the full piece below. Besides watching other C4D users, I like to walk around and absorb everything NAB has to offer. I do this by stopping by other booths to see up-coming gear, software, and technology they’re promoting. And one of the biggest trends on everyone’s mind this year included VR and AR (Virtual Reality and Augmented Reality). Because of these two new emerging medias, everyone was preparing for how to integrate these concepts into their marketing tactics. The show addressed all aspects of these trends including hardware, content creation, and post-production. It was evident that Virtual Reality and Augmented Reality were the hot topics around the convention center this year. 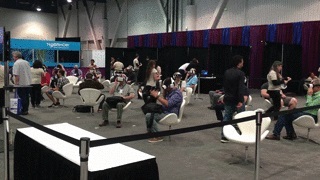 One of the many VR booths at NAB can be seen below. The NAB show is always an incredible time. I love being able to learn and meet people from the motion graphic and post-production community and explore new and upcoming gear and technology. I always leave eager to try out everything I learned, and go back the next year.